MOORHEAD, Minn. – The Gustavus women’s track & field team scored 95.5 points Saturday at the Cobber “Snownami” Open on the campus of Concordia College, good for a third place finish out of 11 teams. Tierney Winter (So., Waterville, Minn. ) broke the school record 1,500-meter outdoor time, finishing seventh with a time of 4:45.16 to break Becca Wold’s record of 4:45.36 set in 1998. 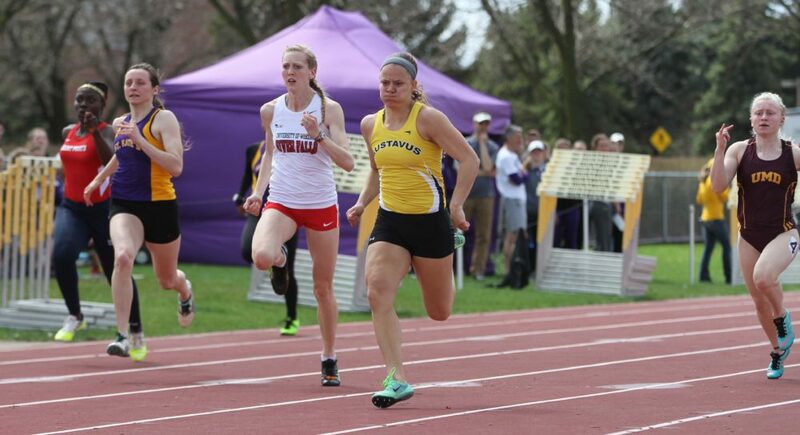 McKayla Stowell (Jr., Le Sueur, Minn.) led the Gusties with a first place finish 100-meter dash, clocking in at 12.39. Stowell also placed third in the 200-meter dash with a time of 26.57. DeAnna Giles (Fy., Plymouth, Minn.) finished second place in the triple jump at 36-2.25. Two Gustie distance runners finished second and third in the 5,000-meter run. Sadie Klug (Sr., Waseca, Minn.) was second at 18:02.08, followed by fellow senior Olivia Rosenow (Maple Grove, Minn.), who finished in 18:06.44. In the 400-meter dash, Lily Anderson (So., Waterville, Minn.) earned third place with a time of 1:00.84, an outdoor career best. Another third place finish came from Katie Keelin (So., Burnsville, Minn.), who led the Gustie throwers with a third place hammer throw of 155-5.